Every Jew is a link in the chain of Jewish continuity. Jewish identity is to be appreciated and celebrated. The family and home are central in every child’s Jewish education. Every learner deserves to have his/her personal needs met. Torah, spirituality, ethics, and prayer provide a compass for living life. Below you will find an image of the dismissal route. Please look it over and ask any questions you may have. Please note that for the 30 minutes of dismissal, the first entrance and exit on Northfield Road are reversed (the red arrow is our typical traffic pattern, which we will NOT be using for this 30 minute period). Reminder that Grades 1 and 2 are dismissed at 5:50 pm and Grades 3-7 are dismissed at 6:00 pm. 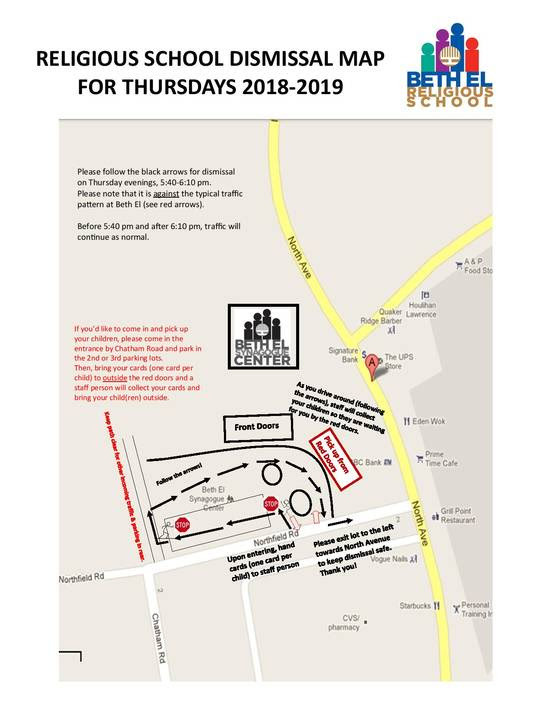 If you have a child in Grades 3-7, even if you also are picking someone up in Grades 1 and 2, please arrive at 6:00 pm so that those who only have a child in Grades 1 and 2 can be at the front of the line. This will ensure a quicker dismissal procedure, which will benefit all of us! Meet our Religious School Educators!